A well-maintained parking lot can make a world of difference in the perspective of your clients. Because it’s the very first thing that they see, any damage or problem can quickly jump out at them and immediately change their opinion of you before they even get out of the car. Allow us to restore and repair your parking space in a quick and efficient manner. If you’re looking for a paving company in NJ that can bring top quality service at a cost that won’t break the bank, then Parking Lot Services has just what you need. We provide the widest range of services, ranging from safety treatments such as pot hole repair and line striping, up to comprehensive repairs for cracks, drainage, and other types of damage. We realize that paved surfaces are an important part of your overall investment. They are also a key determinant of the overall curb appeal or appearance of your property. It affects your customers, or your tenants and their clients. Parking Lot Services has the team, equipment and relationship with suppliers to take on projects for fast food restaurants, local malls, hospitals, churches, professional offices, apartments, condominium communities, and industrial parks. Prevent accelerated wear and tear due to use and weather. Potholes may increase in size during rainy season because moisture weakens the asphalt. Improve the aesthetic and function of your roadways. 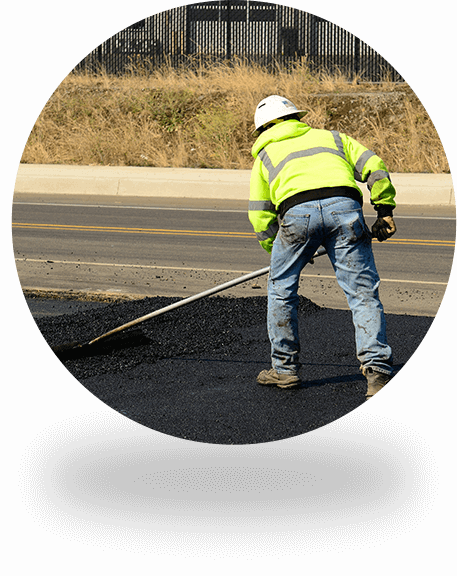 Remove old asphalt for a complete repair of cracks, potholes and damage. Line striping allows better and safer vehicle and pedestrian traffic flow. Make sure your catch basin continues to drain your parking lot by keep it of debris. First impressions are important to a business, and great curb appeal starts with your walkways. Our experts at Parking Lot Services are available to answer any of your questions about your upcoming parking lot project. The following are some of the more frequent questions we encounter with some of our New Jersey clients. On average, applying seal coating every 2 to 3 years is good. The recommended frequency depends on the volume of traffic and type of traffic. For example, parking lots with heavy truck traffic should be done more often to protect the asphalt and extend its life. Parking Lot Services can give you specific advice when we examine your parking lots and speak to you about your plans. What are the various types of maintenance? Preventive maintenance should be done while the pavement is in good to excellent condition. Types of preventive asphalt maintenance are seal coating (every 2 to 3 years); timely crack sealing while the cracks are narrow, short and infrequent; and regular catch basin cleaning fall into this category. Corrective maintenance includes more extensive crack repair and sealing; pothole filling; pavement patching, and repair of drainage and curbs. Emergency repairs are sudden sink holes. Emergencies may require major rehabilitation and reconstruction including the substrate. Poorly maintained catch basins may also crack around the edges and fail to drain the parking lot, creating nuisance and possibly a hazard. Rehabilitation and reconstruction usually involves milling out old asphalt and properly disposing of it. It may also involve repairing the foundation of the parking lot or roadway before new asphalt is installed, cured, sealed and lines painted. Curbs and catch basins are likely to be involved as well. Why is seal coating asphalt on a regular basis so important? Sealcoating protects the asphalt pavement against water; chemicals like salt, oil and gasoline; and sunlight which all cause the asphalt to oxidize and break down. When the protective coat breaks down, water undermines the paved surface which can lead to cracks and potholes with successive freezing and thawing. Sealcoating works by minimizing the ability of these destructive elements to work into the asphalt and break down the pavement. It also protects the pavement against the normal wear and tear from traffic by increasing the flexibility of the asphalt, which retards cracks. The quality of the material and the preparation of the surface are the keys to successful sealcoating. Special attention to any oil stained areas is critical. In addition to cleaning, it may need to be primed so that the seal coating adheres properly. You should ask questions about the quality and quantity of the seal coating that will be applied. It must be applied in the right thickness to create the right seal that extends as well as beautifies. Sealcoating is also part of beautification, adding to the curb appeal of a parking lot. Seal coated asphalt is easier to clean. Restaurants, for example, need pavement in good condition to withstand pressure washing. It’s also easier to remove snow because the surface is smooth. Sweeping is also more effective when the pavement is sealed. Smooth, sealed surfaces also discourage accumulation of dirt and seeds which allow small vegetation to get established. The tiny roots will widen cracks and help break down and undermine the surface. It also detracts from curb appeal. Seal coating on a regular schedule pays dividends since it extends the life of the paving. Applying sealant is less expensive than breaking up the pavement and repaving or having to do extensive patching or adding a new pavement layer. When can seal coating be done effectively? Minimal recommended temperature at application and during the curing period is 55 degrees Fahrenheit. Higher temperature is better. Traffic should be kept off for at least 18 hours, which is why large sealcoating jobs are done on weekends, overnight or in sections. It’s also important to do seal coating when no rain is expected for at least 2 days. Sprinklers should be kept off also. When you inspect a parking lot, what are some of the conditions you look for? What kind of cracks are there? What is their density and location? How deep and wide are they? What story does the network of cracks tell about what’s causing them that might not be visible otherwise? Are there potholes? How deep are they? How frequent are they? Are there upheavals or concave areas in the parking lot that indicate issues below the surface (as a result of how the parking lot was built originally)? Are there signs of inadequate or problematic drainage? What are the conditions of catch basins and surrounding areas? Are concrete areas like sidewalks free of cracks, flaking and broken surfaces? Are markings visible and meet current standards? Can the layout of the parking lot be improved to provide more or safer parking spots? Are there any structural issues around signs or light posts? Are there issues as a result of prior poor maintenance? Are any roots of trees undermining the surface? Are some areas more worn than others and need more intensive repair than the rest of the lot or driveway? Do handicapped-accessible spaces exist in the right ratio, and marked consistent with current regulations? Parking Lot Services was recommended to us. We’re very happy with the outcome. This paving contractor worked around our schedule. Our parking lot had some cracks and potholes. Parking Lot Services did a great job. They were sensitive to our hours of operation. Easy to work with sealcoating contractor. Working with Parking Lot Services was really easy. They gave us a fair price for seal coating and we’re really pleased with the outcome.